Happy Valentine’s Day! If you’re anything like me, you’ve waited until now to figure out what you want to cook for your Valentine tonight. Well rest assured, ChefUniforms.com has got your back! We’ve thought ahead and put together a few ideas for easy, last-minute Valentine’s Day treats that are sure to get you some brownie points (pun intended). So, put on those chef coats and get ready to wow your loved ones this holiday. 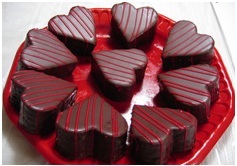 Heart Shaped Brownies are always a great option. They’re quick, easy, and best of all, fudgy! How about a nice heart-shaped pizza for dinner? Show your loved one that you really care, and put some of their favorite toppings on a delicious slice of pie. 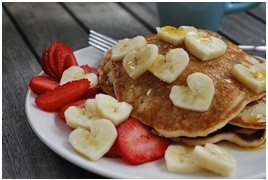 Pancakes are always a great way to say “I love breakfast, and I love you”. Put some of their favorite fruit on top, and cut it into the shape of a heart. Your Valentine is sure to be syrup in your hands! 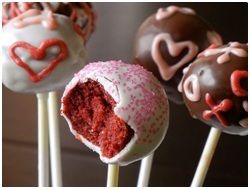 Cake Pops are becoming ever-popular these days… so why not incorporate them into Valentine’s Day? Make some red velvet cake pops to bring the holiday to a delicious close. Chocolate-covered strawberries are a great one for the whole family to enjoy, and they even come pre-shaped into little hearts, courtesy of Mother Nature. Of course, these are just a few simple options – if you want to get really professional, you’ll have to put your own personal twist on a great recipe. 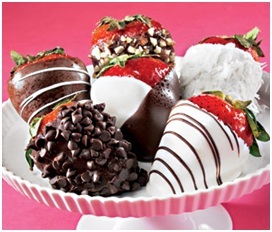 If you’ve got any other ideas of great last-minute, easy Valentine’s Day treats, leave us a comment below! ← National Snack Food Month: Which is your Favorite?